Home > News > Uncategorized > Maxilead Christmas Prize Giveaways! Our Big-hearted bosses are giving away a prize a day from now until Christmas! There’s a range of festive goodies up for grabs at our Tyldesley based site.Every customer who passes through the gates over the festive period will be entered into a daily prize draw. The prize changes every day- there’s a different one behind every door of Maxilead’s giant advent calendar, which now proudly stands in reception. 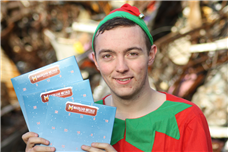 Just think, next time you trade in your scrap metal, you could be walking away with a HD Widescreen TV, hundreds of pounds worth of highstreet vouchers and many more prizes to help you out this Christmas. Rumour has it that that Santa might be making an appearance, so keep your eyes peeled! Don’t forget- from December 3 the Scrap Metal Cash Ban comes into effect. Changes in legislation mean that the scrap metal industry can no longer offer their customers cash payments. Instead, Maxilead will now offer customers a choice of convenient payment options including cheque, bank transfer or Visa debit card. To save yourself time and money and to beat the deadline rush simply call into our office and ask for your Maxilead Metals Account Form to arrange payment terms to suit you. So, next time you call in at Maxileads simply bring your photo ID and sign up for our membership scheme It won’t cost you a scrap and entitles you to a range of exclusive benefits including a guarantee on the best possible prices on all grades of metal.